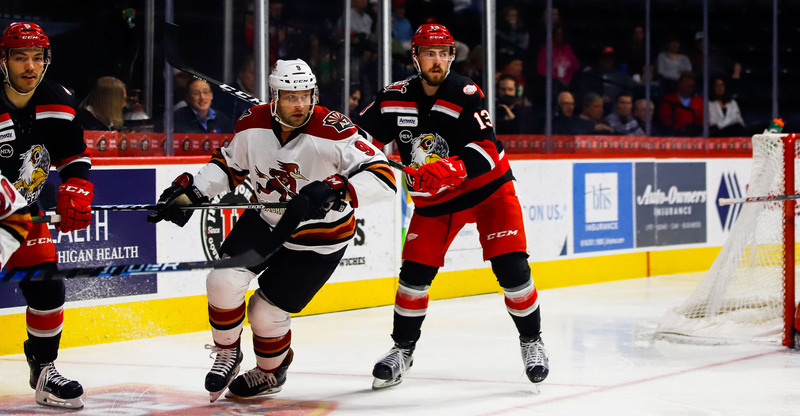 In making their final stop in Western Michigan this regular season, the Roadrunners fell to the Grand Rapids Griffins by a 3-2 score Wednesday night at Van Andel Arena. Both teams bent, but neither really broke. Tucson, though coming up short, made a rather respectable recovery once finding themselves in an early hole after the Griffins buried their first two shots of the contest. Grand Rapids grabbed a 2-0 lead just over six minutes in, transitioning to execute on a pair of Grade-A chances caused by Tucson turnovers in both the neutral and defensive zones. The Roadrunners would settle down in the latter half of the first, registering the final five shots of the period. With 5:50 left to play in the second period, the Dylan Strome buried a gorgeous Nick Merkley feed to give the Roadrunners their first goal of the game. Strome’s marker, his 21st of the season, set a new team record for goals scored by a player in a single season, surpassing Christian Fischer’s team-high of 20 during the 2016-17 campaign. Less than four minutes later, Mike Sislo found Jens Looke alone in front of Grand Rapids’ net – initiating Looke’s sixth goal of the season with a pass from the point to tie the game 2-2. With 11:34 remaining in regulation, Grand Rapids’ Eric Tangradi beat Hunter Miska with a wrist shot from atop the left circle after skating into the Roadrunners’ zone alone – a goal that would ultimately serve as the game-winner. Miska stopped 19 of the 22 shots he faced in the loss. In his return to the lineup for the first time in 11 games, Nick Merkley finished the night with one shot and an assist. Pierre-Cedric Labrie and Trevor Murphy each made their team debuts, finishing the evening with two shots apiece. 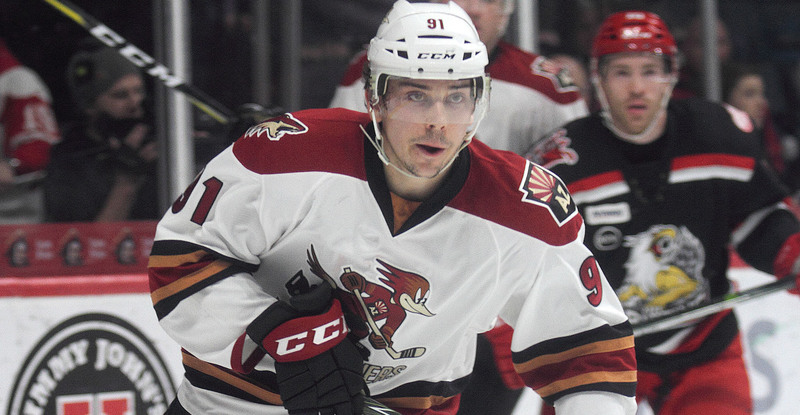 The Roadrunners will continue their three-game road trip Friday night when they take on the Cleveland Monsters at Quicken Loans Arena, where the puck is scheduled to drop just after 5:00 PM MST.